Bed crown canopies hang high above the head of a bed and have hanging fabric panels on each side. They're sometimes called bed coronets or half-crown canopies. Styles range from simple half-round mounts to ornate shapes that actually look like tiaras. Though custom versions get pricey, here's how to make a bed crown the DIY way. Cut a 1-inch thick sheet of medium-density fiberboard (MDF) into a half-round shape with your jigsaw. The straight side can measure anywhere from 1/3 of to the full width of your bed, depending on the look you want. Sand the cut edges smooth with medium-grit sandpaper. Attach two L-brackets to the underside of the cut MDF, one at each end. Attach them at the straight side, with the unattached L-shape hanging down. You’ll attach those to the wall later. Calculate the amount of fabric you’ll need by measuring from your desired mounting height to the floor, and then adding another 25% to the total. Double that result so you'll have enough fabric for both sides. Measure in inches, and then round your total up to the next yard. Staple the outside edge of the first fabric panel to the top of the MDF board, at least an inch over the edge. Make sure the right side (the pretty side) of the fabric faces away from the board. Staple the inside edge of the fabric panel to the very center of the board’s curve. Find the center of remaining fabric, and staple it between your two first staples. Continue pleating and stapling this way until the entire panel is attached to that side of the board. Repeat with the second fabric panel on the other side of the MDF board. Hang the MDF piece above the center of your bed by screwing the hanging portions of the L-brackets to the wall. Hang it at the height you chose earlier. Mount a drapery holdback to the wall on each side of your bed, at or just inside the outer edges of the bed. To determine the placement, have someone hold the fabric panels back at different heights while you stand back to look. Depending on your bed height and style, the holdbacks should typically hang at 1/4 to 1/2 of the bed crown height. Gather the installed fabric panels and hook them behind the holdbacks. Pull at the upper portion of the panels, just above the holdbacks, until you like the draping. Fluff and arrange the bottom hem of the fabric panels until they puddle attractively on the floor beside and just behind the bed. 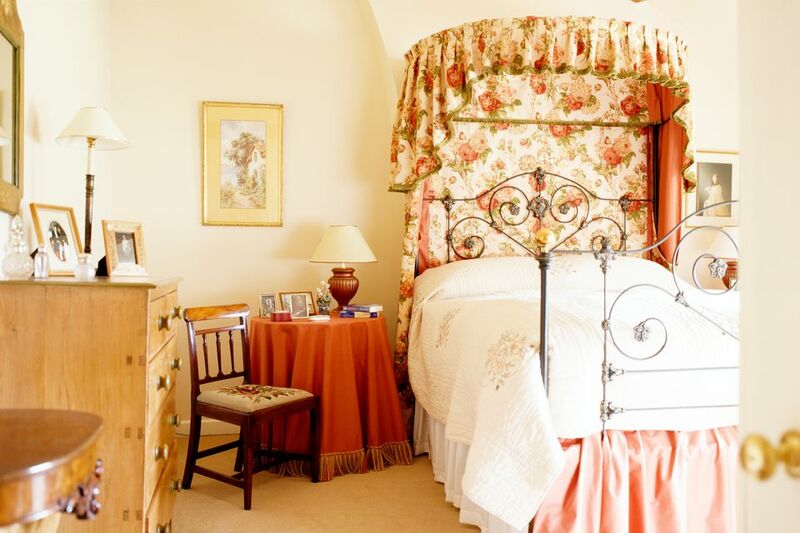 Staple a coordinating fabric directly to the wall just beneath your bed crown. Pleat it into folds by hand as you staple. Make sure the bed crown panels stapled to the MDF hide the outer edges of the back wall fabric. Center an LED puck light on the underside of the bed crown board. Install it as the manufacturer instructs. Hide the cord behind one of the fabric panels, but make sure you can access the switch. Wide-width fabrics work best for DIY bed crowns. Upholstery and drapery fabric is typically 54 to 56 inches wide. Fabric and hobby store yardage may be narrower, anywhere from 24 to 36 inches wide. Narrower widths look skimpy above anything larger than a twin-size bed unless you use two fabric widths per side. If you plan to edge your fabric panels with decorative trim, attach it before stapling the fabric to the MDF board. Stitching by hand looks best, but you can use fabric glue if you don't sew. Instead of cut yardage, you can repurpose vintage textiles for your bed crown fabric — a pair of secondhand drapery panels or two vintage chenille bedspreads, for example.